While gardening between El Niño storms, I inadvertently threw a snail through the open window of a passing pickup truck. I realized this because, unlike previously tossed mollusks, I didn’t hear the sound of shell hitting asphalt. If the driver had stopped, I would’ve apologized and explained that it wasn’t personal—at least not where he was concerned. 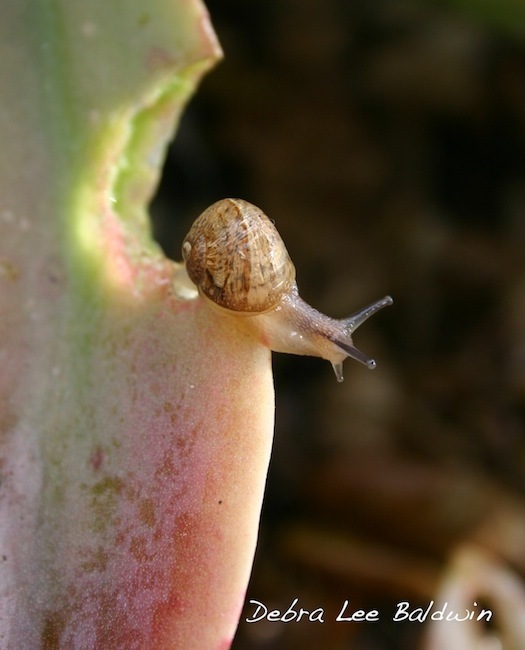 The snail photo is from the first edition of Designing with Succulents, which means the snail would be 10+ years old had it lived. Of course it didn’t. Snails reproduce in abundance in wet weather and unless stopped chew unsightly holes in plants. This is truly a shame because succulents keep their leaves a long time. An environmentally friendly bait is Sluggo, but it’s expensive, as are decollate (predator) snails—which in any case are not legal in every California county. The most expedient method, squashing underfoot, leaves a sticky residue on shoes. So I step on a leaf instead, which is one reason I grow nasturtiums. Set a snail on the ground, place a nasturtium leaf atop it, and step on it. If there’s no crunch, find harder ground. But not your patio; snails stain. An even bigger concern during El Niño is that succulents, which come from arid climates, may rot. Stems or trunks turn squishy and collapse. It may be possible to take cuttings from healthy top growth and restart the plants—as I did that rainy winter with aeoniums. Fortunately, the rest of my succulents came through fine, despite double normal rainfall. After all, it’s not water that causes roots to rot, but drowning from lack of oxygen (plus microbes). Consider: Agave attenuata, crassulas, yuccas and other succulents thrive in Hilo, Hawaii, shown below, where precipitation averages 200+ inches a year. 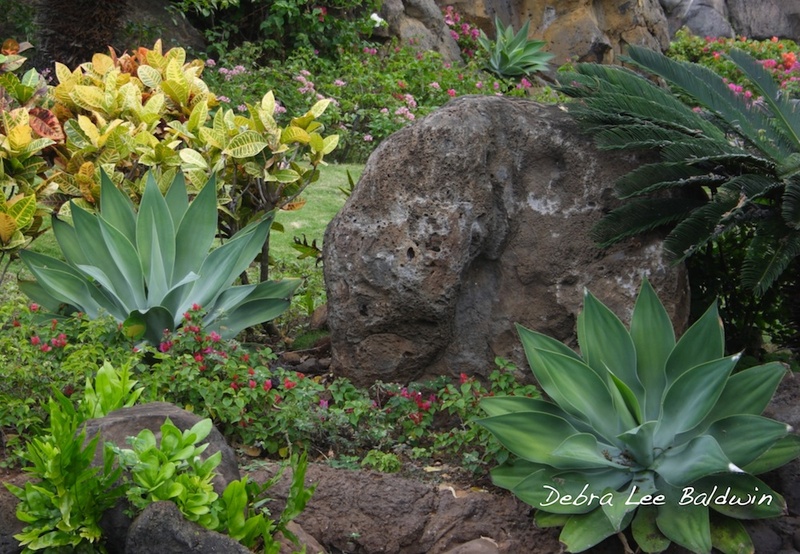 Rain bathes the roots continually, but they stay aerated and healthy because the soil is fast-draining lava rock. If succulents occupy low-lying areas of your garden where rain tends to puddle, and you don’t want to move the plants to higher ground, use a patio umbrella to keep them from being soaked. Channel run-off with rocks, sandbags or trenches; and top-dress soggy soil with pumice to absorb standing water.